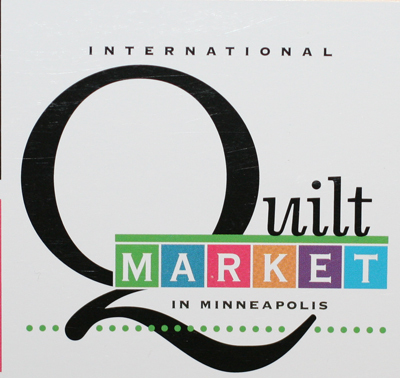 There is so much to take in at Quilt Market that I’m never sure where to start in trying to share it all. Part of the problem is that it is completely impossible to share everything! There are hundreds of exhibitors at Market. Of course there are all the wonderful quilt fabrics one would expect, but there is so much more – needle crafts, new rulers and gadgets, books, notions, machines, supplies for many textile arts, patterns… I don’t even think I saw everything when I was there, and by the end of each day I felt like I had walked for miles. There seemed to be more clothing shown at this Market than there was at last spring’s market. And there are more fabric companies expanding their knit lines as well. Alison Glass has a new knit line coming out with Andover. 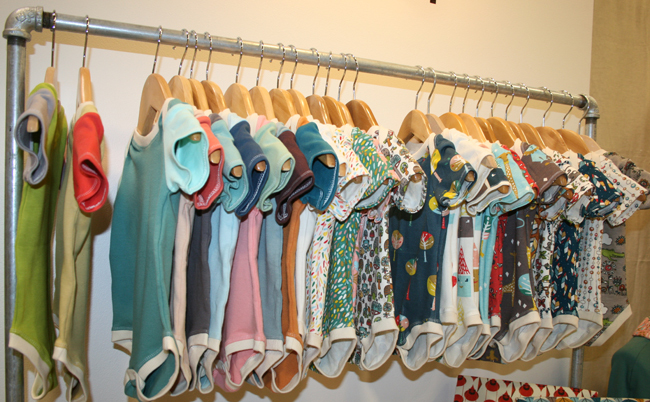 Birch Fabrics showed off some of their organic knit collections in an adorable display of baby bodysuits. Birch was also showing their organic double gauze, which is OH SO NICE. The International Quilt Association had a special exhibit featuring some of the winners from their annual judged show in various categories. The styles ranged from traditional quilts to more contemporary designs. Some were hand quilted, others machine quilted. The work is amazing. 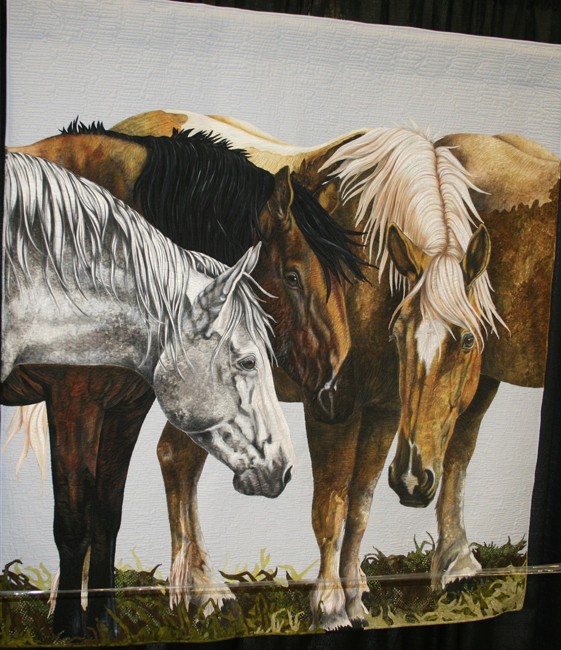 This quilt is called One Fine Day and it was created by Laurie Britt Piper of Bakersfield, California. 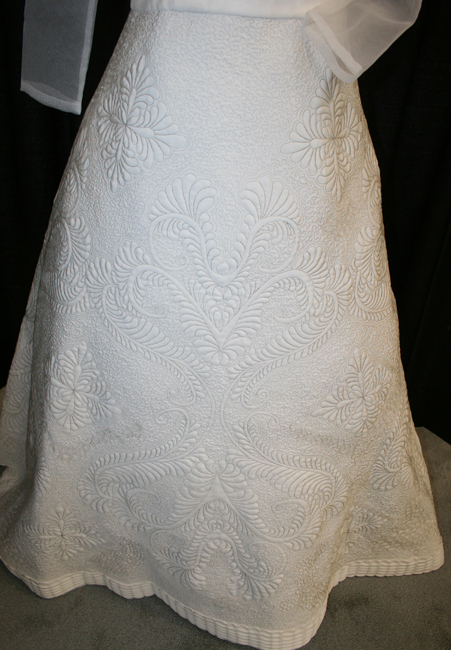 The quilt uses raw-edge applique and is fused and painted. It won first place in the Art – Painted Surface category. It is even more stunning in person. 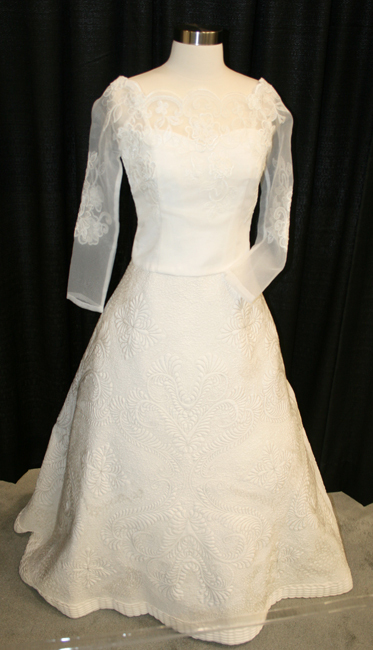 This wedding dress by Yujo Murakami took third place in the Wearable Art category. It was hand appliqued and free-motion machine quilted.